Alden Bryan, a major figure in Vermont art history, painted profusely and traveled relentlessly during his long lifetime. A retrospective on display at the Jeffersonville gallery that he founded features several examples of these overlapping passions. “Travels With Alden” includes a few dozen of the landscapes that Bryan (1913-2001) composed in Arizona, California, Europe, Africa, Asia and the Caribbean. Harbor scenes of Maine and Gloucester, Mass. — which may rank as Bryan’s finest works — are also featured in the exhibit marking the 100th anniversary of his birth. When not roaming the globe, Bryan was painting on and near the Jeffersonville dairy farm that he and his wife, the artist Mary Taylor Lewis, purchased in 1939. Several familiar panoramas of northern Vermont are mixed in with Bryan’s renderings of more exotic settings in this diverse show. Although Bryan was seemingly born to paint, it was Mary’s commitment to her own art that inspired him to pick up a brush a couple of years after graduating from Harvard with a degree in economics. And it was an early mentor, Gloucester painter Charles Curtis Allen, who introduced Bryan to the beauties of Vermont during a joint two-week painting sojourn in the area around Smugglers’ Notch. 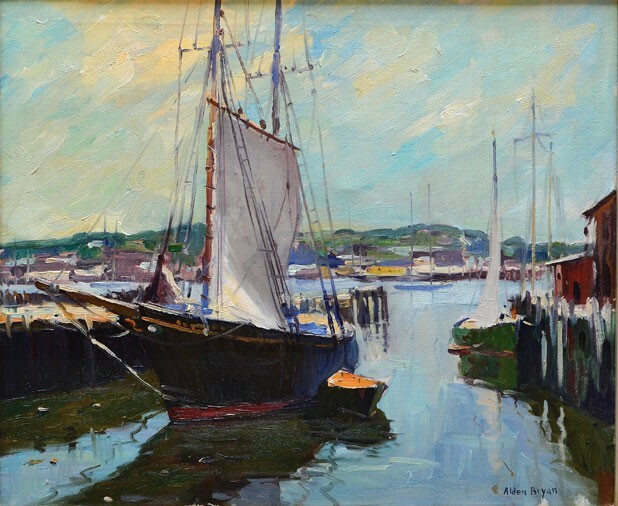 Bryan also studied plein-air technique with American impressionist Emile Gruppe, who spent summers in Jeffersonville and Cambridge, and whose landscapes can be seen at a Jericho gallery that bears his name. Bryan was “a master of light — it forms the backbone of his painting,” the artist’s grandson, Beckner Bryan, said in a recent talk at the “Travels with Alden” show. Skies are also an important element of his grandfather’s works, Beckner Bryan pointed out. At his best, the artist approximated Winslow Homer’s versatility in capturing the cold light and glowering clouds of northern New England, as well as the piercing sunshine of the tropics. Bryan’s searingly lit studies of a lighthouse and a Buddhist temple in Sri Lanka are just as convincingly composed as his snowy Vermont scenes. And, as the Gloucester paintings demonstrate, Bryan could at times match Homer’s ability to depict water in motion. One of the best works in “Travels With Alden” — and one of the eight that have so far been sold — is a 1940s oil titled “Dipnetting for Sardines.” In it, two skiffs billow smoke into the night sky from flaming smudge pots that illuminate the fishermen’s work. The moody contrasts of grays and blacks may remind viewers of Whistler’s nocturnes. Bryan was clearly a skilled painter of nature scenes, but his range was narrow and his style conservative. In “Travels With Alden,” he only occasionally attempts to depict the human form and never details facial features. Bryan also appears entirely uninfluenced by the movements that revolutionized the visual arts in the 20th century. He was something of a polymath, however. When not hauling his easel around northern Vermont and to distant lands, Bryan worked as a progressive dairy farmer, introducing Jeffersonville to the innovation of pasteurized milk. He also established a bakery and restaurant, designed the base lodge at the Smugglers’ Notch Resort and built the first indoor tennis center in Vermont. The Bryan Memorial Gallery is another of his works — this one dedicated to the memory of his wife, who died in 1978. Bryan never intended the spacious showcase to be all about him. Indeed, he instructed the gallery’s director to wait at least 10 years after his death before mounting a comprehensive exhibit of his work. “Travels With Alden,” which opened earlier this year, respects the artist’s wish. Generous as well as self-effacing, Bryan used the gallery as a place to show works by artists he admired. That tradition continues to this day. Assistant director Jim Gallugi notes that about 50 artists, mostly from Vermont, are currently represented in the gallery. Visitors drawn by “Travels With Alden” — the subject of an American Art Review essay by gallery director Mickey Myers — can thus become acquainted with the work of several living Vermont artists. Bryan would no doubt be pleased to present their work to a broad set of potential patrons.